Ninety-six percent of the world's consumers and more than three-quarters of the world's purchasing power lies outside the U.S., where exports account for just 14% of our country's GDP; by contrast Germany's exports account for nearly half (46%) of its GDP. 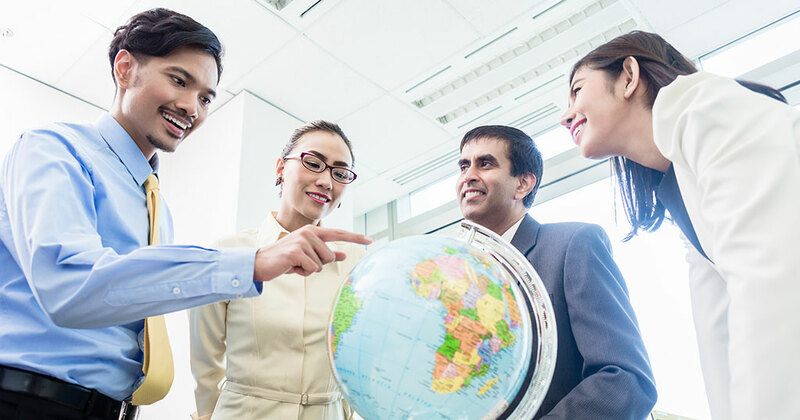 While just 1% of the 29 million U.S. small businesses currently export, a survey of the IFA's franchisor members indicates more than 70% believe international development is very important to the future of their franchise. Bringing a franchise brand to a new country requires significant investment and a positive local investment climate. High annual GDP growth in a country means higher new investment. For the first time in a decade, the world's major economies are growing in sync -- the first time since 2007 that all are growing. The IMF in July projected global economic output would grow 3.5% this year and 3.6% in 2018, up from 3.2% in 2016. Let's take a brief look at where good economic growth and franchise development opportunities are expected in 2018. Argentina. The positive economic reforms of President Macri have turned around the Argentine economy, which is expected to grow at a rate of 3.2% in 2018. U.S. brands are highly desired in Argentina, good news for U.S. franchisors. In Brazil, the region's largest economy, there are signs of life after the continued implementation of positive economic reforms. GDP growth is estimated to be 1.8% in 2018 after many years of negative growth. U.S. franchisors should once again consider market development activities in this huge market. Mexico, with an expected GDP growth rate of 2.2% in 2018, should provide better opportunities for U.S. franchisors than 2017, which was a down year after the 2016 U.S. elections. Peru's GDP growth is expected to be 3.9% in 2018. U.S. food and beverage franchise brands have been well-received in this country with its fast-growing middle class. This region is expected to have a GDP growth rate of 6.2% in 2018. Exports are up, as well as business investment, with strong levels of domestic demand across the region -- a good trend for franchisors. China. The IMF has revised China's growth forecast for 2018 to 6.4%. New franchise development in China is hindered by increased government regulation of foreign brands and the emergence of strong local franchises. India expects GDP growth of 7.5% in 2018, and the IMF predicts it will crack 8% in 2021. Although the business environment is a major challenge to navigate, the size of the market continues to draw attention. Consumerism is on the rise thanks to a rapidly growing middle class. Japan's GDP is expected to grow 1% in 2018. The combination of rising consumer confidence and significant business investment continues to provide opportunities for U.S. franchisors in this major first-world economy. The Franchise Association of New Zealand published a survey showing that this is probably the most franchised country in the world: 11% of its GDP is from franchising, versus 3% in the U.S. In a country of 4.7 million people, there are more than 630 franchises. The Philippines continues to be the new star for U.S. food and beverage brand development. For example, after two years of operation, the Denny's country licensee has four restaurants open in Greater Manila. GDP growth in the European Union (EU) is projected at 2.8% in 2018, the highest in more than 10 years. Business confidence is at its highest point in more than a decade. Central Europe. With 2018 expected GDP growth of 3.3% in Hungary, and 2.8% in Poland and the Czech Republic, these markets offer good opportunities for U.S. franchisors. Ireland is one of the fastest-growing EU economies, with expected GDP growth of 3% in 2018. New franchise investment is expected to increase accordingly. Italy's relatively low GDP growth rate is being offset by increased business investment and significant household consumption, making this market a surprising bright spot for U.S. franchisors. The popularity of U.S. brands continues to attract Italian investors. Spain, with GDP growth estimated at about 3%, continues to benefit from a dynamic economy, with record levels of tourism and domestic consumption, as well as exports and business investment. New franchise development is now limited only by the availability of cost-effective retail space for new franchise locations. The United Kingdom is moving ahead with Brexit implementation. The uncertainty associated with the breakaway from the EU is expected to lead to a low GDP growth rate in 2018 of 1.3%, which will likely lower new investment. Regional GDP growth in the Middle East is expected to recover to 3% in 2018 as oil prices are expected to rise modestly. Egypt was long a bastion of international franchise development before a prolonged economic slowdown. In recent months, the government has put in place politics that have resulted in strong foreign investment. The Economist predicts GDP growth of more than 4% in 2018. Perhaps it is time to reconsider this large market. The United Arab Emirates continues to be the place in this region where new U.S. franchise brands first enter because of the positive and open business environment and the receptivity to new brands. The IMF expects GDP to grow at 3.4% in 2018. Potential investors in international franchises around the globe are increasingly sophisticated, have high unit sales expectations, and are negotiating a lot more of the terms of license agreements. While a domestic single- or multi-unit franchise agreement can take a fairly short time to complete, closing an international license agreement can take 1 to 2 years and another year to open the first unit. To find and sign the best international licensees, it is critical to show the clear differentiation of your brand from what already is in their country. To determine if a country has the potential to provide you with an acceptable return on your investment, it is essential to know the unit economics and viability of your brand ahead of signing an agreement. William Edwards is CEO of Edwards Global Services (EGS). Contact him at bedwards@edwardsglobal.com or 949-224-3896.